Amanda Lovegrove in art class at the Darien Arts Center. 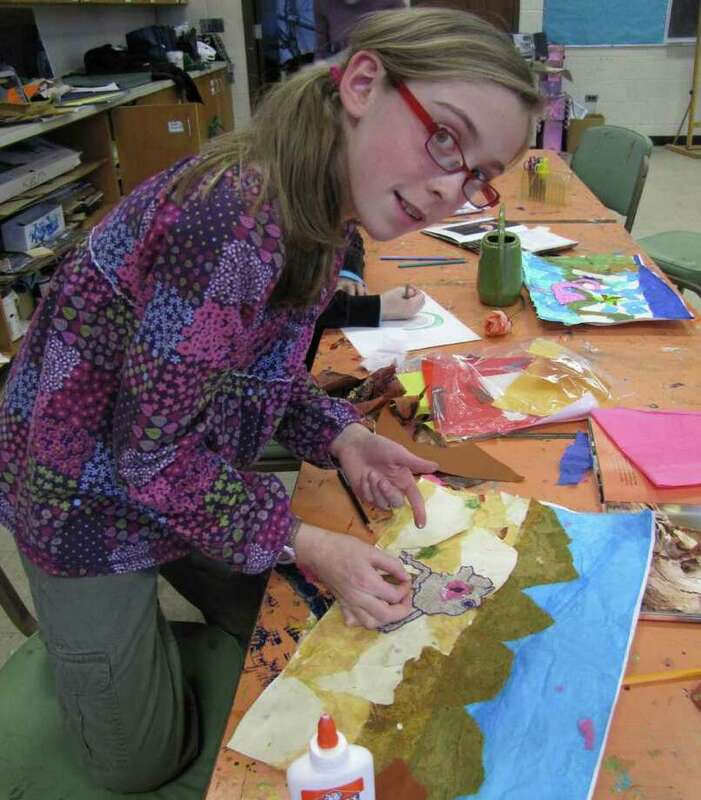 The Visual Art Department of the Darien Arts Center offers many new classes for aspiring young artists beginning Feb. 6, and registration is open now. Students in fourth through sixth grades may register for The Artist's Process: Creating an Artist's Sketchbook. The sketchbook is an essential tool in the artist's process. Students will work on various projects, including collage, drawing, painting, and printmaking, all to encourage new ideas for art making. This class is offered on Wednesdays, from 4 to 5 p.m.
Also for fourth- through sixth-graders, Sculpt and Build is devoted to those who love to build. This class will create sculptures using a wide range of media. Students will investigate sculpture from ancient times to contemporary in their quest to create their own three-dimensional masterpieces. This class is on Mondays, from 6:05 to 7:20 p.m. In Graphic Illustrators, students ages 10 to 15 will learn about contemporary graphic novels, while exploring the process of producing a graphic story, from how to generate ideas, planning and sketching, to creating a finished piece with characters -- comic, dramatic, superheroes and more -- that are completely their own. It will take place Thursdays, from 4 to 5 p.m.
Art Studio offers upper middle and high school artists a perfect forum to develop a broad body of work and build a portfolio, all with an eye toward future college and art school applications. This will take place on Mondays, from 7:30 to 9 p.m. In addition to these new classes the Darien Arts Center offers favorite pre-school classes, including Little Artists Workshop on Mondays, from 1 to 2 p.m., and If We Build It We'll Have Fun on Mondays from 2 to 3 p.m. Adult art classes begin the first week of February. For a complete list of art classes for children and adults visit www.arts.darien.org or call the Darien Arts Center at 203-655-8683. Founded in 1975, the Darien Arts Center is a nonprofit organization dedicated to providing visual and performing arts programs and events for the community. The DAC offers educational programs in dance, visual arts, kids' theater and music and performances by the Darien Players and Cabaret. The organization is funded by private donations, tuition fees and ticket sales.